The area was nice and safe and walking distance to the beach and restaurants. Good location. They WiFi stopped working and they fixed it the next morning. Localização excelente , pertinho da praia e com facilidade de ir ao centro. Supermercado, padarias, farmácias , lanchonetes tudo bem próximo. E a grande surpresa ....ver um pedacinho do mar da nossa sacada!!! Perfeito!!!! Die Lage der Unterkunft war hervorragend. Nahe am Strand gelegen erreicht man alles recht schnell zu Fuß. Für Sicherheit ist gesorgt da die Anlage bewacht wird. A localização eh perfeita, o proprietário bastante solicito no atendimento. O ar condicionado gela super bem! De tudo, desde a recepção, tudo ótimo o apartamento ótimo, vista linda, lugar tranquilo perto da praia perto da beira mar tudo perfeito super recomendo o Brisa Do Mar. Me gusto la ubicación y seguridad del edificio, nada más. Apartamento super bem localizado. Próximo a Praia, farmácias e supermercado. Com Boa Vista. Muito limpo! Localização maravilhosa e custo - beneficio excelente. One of our best sellers in Fortaleza! Briza do Mar Apartments offers accommodations within a residential building 1,500 feet from Praia de Iracema in Fortaleza. Guests can refresh in their outdoor pool. Guests can choose to book private rooms within an apartment or the whole apartment. The bedrooms are air conditioned, with free WiFi and TV. The apartments provide an additional kitchen, balcony and living area with an LCD TV. Briza do Mar is located 8.7 mi from Pinto Martins Airport. Within a 10-minutes walk, guests will find several restaurants, bars, and supermarkets. 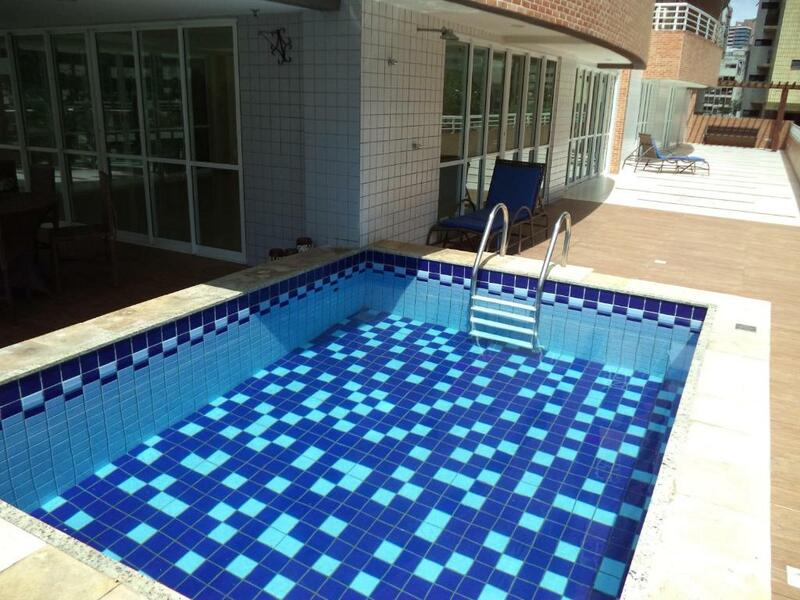 뀐 Located in the top-rated area in Fortaleza, this property has an excellent location score of 8.7! When would you like to stay at Brisa do Mar Apartments? With a balcony, this apartment features an air-conditioned 2 bedrooms with a bathroom each, a living room with a TV and a fully-equipped kitchen. Internet is available. With a balcony, this apartment features an air-conditioned bedroom with a bathroom, a living room with a TV and a fully-equipped kitchen. Internet is available. This air-conditioned room features a TV, mini-bar, ceiling fan and private bathroom. Internet is available. It does not provide a kitchen. This air-conditioned room features a TV, mini-bar, ceiling fan and a private bathroom. Internet is available. It does not provide a kitchen. Brisa do Mar Apartments possui varias tipologias de acomodações que variam de quartos simples com banheiro, cama de casal, ar condicionado, TV e internet wi-fi, apartamentos completos com sala cozinha e varanda e apartamentos com dois quartos. Todas as nossas acomodações sao totalmente privativas, nao temos apartamentos nem quartos compartilhados. Meu nome e Enrico, sou administrador dos apartamentos desde 2010. Meireles e considerada a area mais nobre e segura da cidade, a poucos passos da maravilhosa avenida beira mar toda a area oferece restaurantes, bares, supermercados aos quais e possível chegar em poucos minutos andando. Area Info – This neighborhood is a great choice for travelers interested in food, promenades and beaches – Check location Great location - show map Guests loved walking around the neighborhood! House Rules Brisa do Mar Apartments takes special requests – add in the next step! Brisa do Mar Apartments accepts these cards and reserves the right to temporarily hold an amount prior to arrival. The flat is quiet empty and the kitchen was even worse. Not even dish cleaning materials, no broom or mop. The TV did not work properly and there were constant problems with the internet. The bed sheet and pillow were not clean, apartment was full of ants, there was just half toilet paper roll in bathroom, the towels were horribel dirty and smelly, no soap, the bed was not comfortable. The internet dident work at all. the shower dident have warm water and eachtime to turn off the water gave me pretty strong electricity shock!!! somebody tape it before but obviously dident work still was dangerous. I dont recommend, probably there are better quality apartment around.